We'll have to see how this works out, but it's a good start. Kixeye should also put something else back the way it was - prohibit players from deploying new plats through the "ring of fire." You used to have to have an open spot next to your base to deploy & your plats couldn't go over other plats that were locked in attack. Now people set up the ring & keep deploying right over it. I'm in general very happy about the Moral feature as it will make it slightly more difficult to hold a "Ring of Fire" and it will also make platoon fighting a lot more strategic as a lose will not be payed out as cheaply as before. 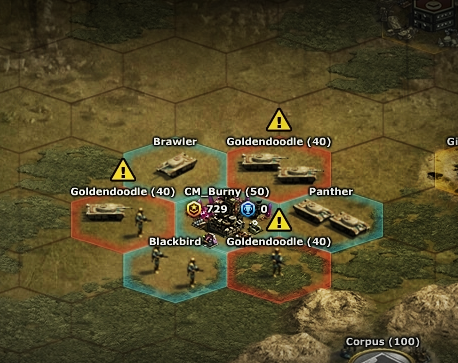 Now, it's only time to wait and see if these changes are effective enough to remove the strategy of holding the base with fighting platoons. What you know of doing pvp? rings of fire won`t stop as they will use more plats and more acc and most time the acc they use for the ring of fire are just seconds of their base so that plat is in just seconds replaced. So this useless and only making things again a bit more complicated with more chances for all kind of bugs and exploits! It's at least a step in the right direction of removing friendly bubbles in PvP. I don't expect every single exploitative behaviour to be fixed instantly. RING OF FIRE HAS NOTHING TO DO WITH 69... WHY CANT YOU UNDESTAND THAT KIXEYE ???? clueless kixeye dont even understand what 69ing is. This has just increased 69'ing now players can't make a "ring of fire"
I understand the strategy needed to be closed because of auto clicker cheat. But did they test a couple of times in the test area? Cant remember what it is called. Havent been there for a few years. This will be a boost for Kixeye as the number of accounts will increase by 8% which makes the Company more valuable on paper. Just do not sell out to EA (Electronic Arts) inc. Been down that road. Players even raised hundreds of thousands to buy back the game. But EA said no, we are closing the game down. Period. Is it any wonder EA is ranked one of the most hated Corporations in the world.! I love these changes... simply due to the number of Ring Of Fire lovers crying out in anger about this. Should do quite a bit to make sector conflicts more level again. Less infamy hoarders attacking without being vulnerable themselves. This, I agree with. A platoon that is under attack is a warzone, being able to freely move through it doesn't make sense. So you are telling me now my one toon that has survived an onslaught of attackers/snipers, is now going to ghost away after I hit 2 toons? Giving a clear way for someone to attack my base. Do you guys even play the game? We told you guys this wouldn't fix the problem and it has only created more problems. This will change nothing... People that would have used RIng of Fire now will start using 69. This has done nothing to reduce 69. Why are you asking for feedback? Better yet, why is anyone responding? You asked for Gear Store feedback a few months ago. Didn't do squat with it. Best update in the game in a while. One of a long line of stupid **** ideas. There, will you listen? Hell no, you'll just complain about my language, which was meant to get at least some actual response from you. what is the point of an alliance if you cannot defend each other??? These wars have been here for a while and because a few are frustrated they can't hit one guy..you (kixeye) choose to make a quick fix to appease a small group.now you're going to threaten to BAN players for playing? .is it ok if we use chat or will that become a bannable exploit as well? (this is WHY I don't do much PVP anymore.Kixeye are biased and ban people for the dumbest reasons). 69, ROF/friendly bubbles have been tactics in wars since attacks went live....and now you threaten to ban players ...LOL..absurd. Why do you want opinions? You've already implemented yet another stupid knee-jerk reaction to something that truly was not a huge issue...good going (not). Yet, you cannot address the real issue...connectivity issues, disconnects, minor glitches.but oh hell yeah let's fix that ROF/69/friendly bubble complaint!